We’ve been having an exceptionally busy time here at Bothen Hill over the last couple of weeks. Finally, after a very slow start, the asparagus has come on streem and harvesting is keeping us exceptionally busy. We’re out every day both first thing in the morning and also in the afternoon at our two locations to harvest and then sort, weigh, bunch and lable – it’s early mornings and late nights at the moment! Last week we harvested the first of our new potatoes, Rocket, which are very popular with our customers. 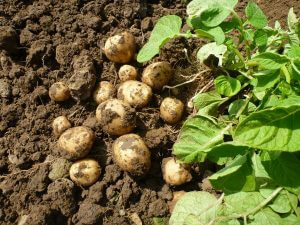 The first new potatoes are always good, everyone thinks that summer is on the way! In addition we have had a very busy time planting out sprouts, cabbages, calabrese, broccoli and squash all of which have also benefitted from the recent rain. The first outdoor lettuces are looking absolutely splendid and we have a new line this year, loose lettuce bags, which are proving to be very popular. A mix of red and green loose leaves they are ideal if you don’t want a whole lettuce and they keep well in the fridge. Many other vegetables are very close to harvest, we have french beans in the tunnels, sugar snap peas and broad beans outside all of which should be available within the next week to 10 days – keep an eye on the web site for updates.